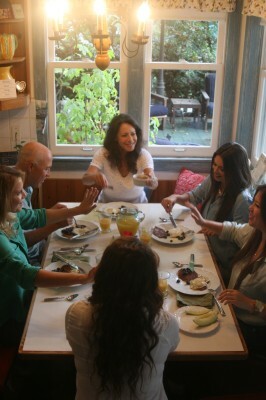 The Curry family enjoying pancakes and fruit at the breakfast table. If the kitchen is the heart of the home, the Curry home has a very healthy ticker. Resting at the top of the hill on 33rd Street in Manhattan Beach, the Curry house looks like it was plucked from the Heartland and dropped at the beach. Painted, vintage watering cans line a faded red bench. Wooden hearts and sunflowers adorn the brown shingles, and a sign that reads “Peace on Earth” hangs next to the front door. The inviting feeling is made good when you walk through the door. 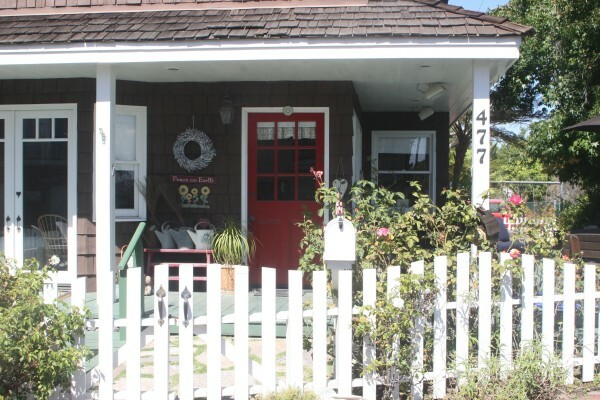 The welcoming façade of the Currys’ Manhattan Beach home. The first room you enter is the kitchen and it is massive. It runs almost the full length of the first floor. Warm oak lines the room and sunlight fills every inch. Above the oversized sink hangs a stained-glass hummingbird with a photo of Peggy’s late mother Evy, below. Alex and Meg joke by the stove while the rest of the Curry clan bustles about. Tim and Peggy Curry moved from one part of 33rd street to another when they built this house in 1993. Having Sam, the youngest of the four Curry girls, meant the need for more space, and Peggy was thrilled to be able to design it. Tim and Peggy met in high school in West L.A. and grew up around each other’s family. Peggy’s parents both worked but Tim’s mother was a stay-at-mom so Peggy spent a lot of time at their house. “I’m the oldest of six and at our house everyone was always in the kitchen,” Tim said. The kitchen table was such an important place to the Curry boys that each of them now has one just like their childhood table in their houses now. “Same white formica with wood trim. Just like when we were kids.,” Tim said. 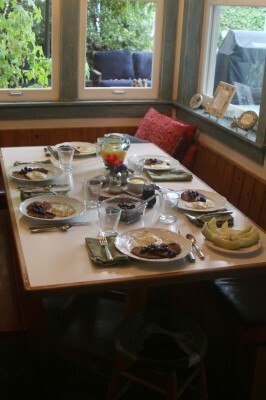 Setting up for breakfast at the kitchen table. Beyond wanting a comfortable place to congregate, Peggy wanted functionality. The appliances are restaurant-grade and the sink is so large the couple would wash two babies at a time in it when the girls were young. Peggy had always loved to cook and knew that she wanted to start teaching cooking classes when the girls got older. She has fulfilled that dream with the help of her daughter Meg. They started Curry Girls Kitchen and teach wholesome, family-friendly cooking in their home to students of all ages. 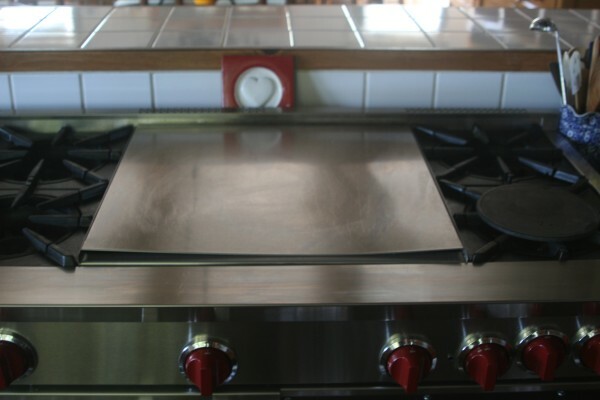 The center of the kitchen is a Blue Star range, a 60-inch behemoth that looks like it could cook enough food to feed a small army. And it has. You don’t have to be a Curry to be welcome in the kitchen. The girls are all grown up now. Alex is 26, Meg is 24, Annie is 21 and Sam is 20. But they still end up in their parents’ kitchen often.